Randomly, I decided to follow up on something that has been gnawing at me since my trip to Fort Wayne last month. Hang with me while I tell you the back story. You see, on my way out of town, I decided to stop at McCulloch Park. It's across the street from General Electric (on Broadway) - a place where several family members and friends of family members worked for years. 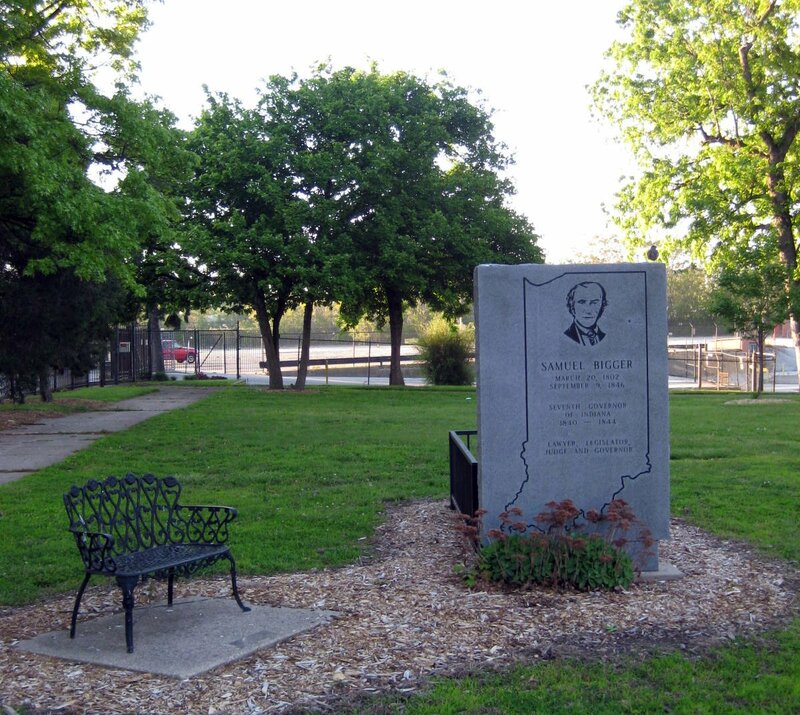 I'll get around sometime to posting the pictures of the park like stuff - like the gazebo, and the merry go round, and the slide...but today's post is about the almost forgotten public servant of Indiana - his name is Samuel Bigger. Now what's Samuel Bigger doing in one of my memories about growing up in Fort Wayne? Good question. One time, while walking down Broadway with my grandma and grandpa, his name came up in conversation. Now mind you - he only came up as a side conversation. The original conversation was about the early days of McCulloch Park. My grandpa said that it used to be a cemetery. My grandma said that if it was a cemetery, than others aside from Samuel Bigger would have been buried there. And as they were "discussing" this - I asked, "Who is Samuel Bigger"? * He died really young (although at the time - I didn't think that 43 was young - I've since reconsidered). So when I was in Fort Wayne last month, on a whim, I stopped by McCulloch Park - at like 7am - and decided to take a look around. I had totally forgotten about the Samuel Bigger grave or even the conversation with my grandparents. I started out focusing on the pavilion/band stand (it was being renovated) and then I moved over to the slide and merry go round. Lots of fond memories of playing in this park. As I walked towards Broadway (to see if the GE Club was still around), I practically ran into Samuel Bigger's grave site. That's not what it looked like the last time I saw it (see black and white photo to your right - THAT'S what it looked like when I last saw it). And that's when my grandparents conversation popped into my head. You know (I thought), we never did solve the mystery of - was this a cemetery before McCulloch Park or not. 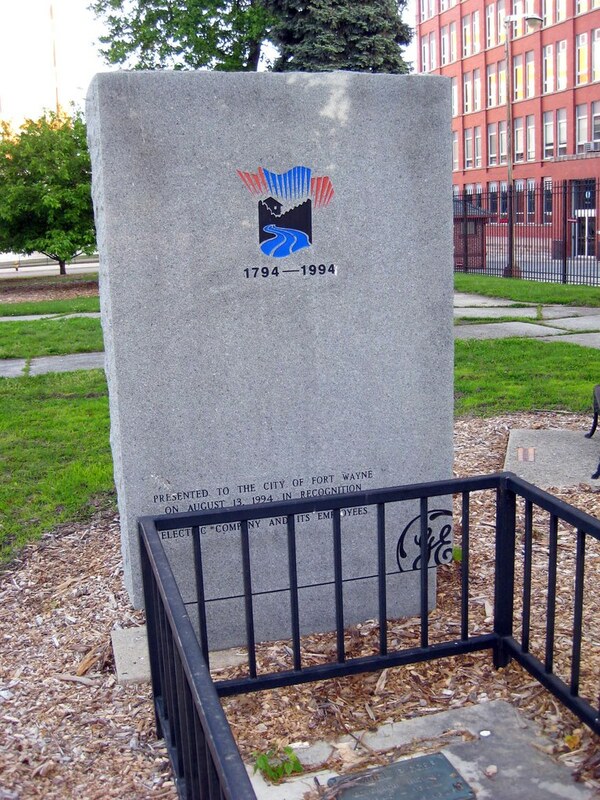 Side note: Upon further inspection, I saw that the employees of GE had donated the really nice memorial to Governor Bigger in 1994. I was bugged tremendously. Went through all of my Fort Wayne books. Surfed the web. Finally came to the conclusion that yes - my grandpa was right - McCulloch Park had been a cemetery. It was called Broadway Cemetery. Now interestingly enough, there were other people buried here, but for some reason, they were all moved to the new Lindenwood Cemetery (Lindenwood was the brain child of 12 business men who thought that Fort Wayne needed a larger, nonsectarian, and nonprofit cemetery). According to one of my many Fort Wayne books, none of Samuel Bigger's living relatives had any interest in moving him to Lindenwood, so he just stayed put. And unfortunately, he stayed put in a grave site that was unmarked (just covered with a concrete slab). It's kind of weird to think that a man who gave so much to this state, would be practically forgotten (and abandoned) in a cemetery/turned park area. In 1908, it seems that the City Council of Fort Wayne was bothered by this and below, I've included the resolution that they passed calling for a memorial to be erected. "In what was formerly known as the Broadway Cemetery, now known as the McCulloch Park, in the city of Fort Wayne, there lie the remains of Samuel Bigger, ex-Governor of the State of Indiana who served in that official capacity from 1840 to 1843 with credit to himself and honor to the State, after having served for many years as the sole representative of the State of Indiana in the House of Representatives of the United States, from which once he resigned to accept that of Governor of the State. It may truly be said that he saved the honor of the State in his refusal to consent to the repudiation of the then State debt, and it is no less true that to his refusal was probably due a subsequent payment by the State of the debt, which at that time others thought should have been repudiated. Never since that time has the State been on the verge of repudiating its debt. It is certainly an honor to the city of Fort Wayne that it can claim the residence, in part, of a governor of such immense value to the State of Indiana, and the resting place of his body. This city never had the honor of claiming the residence or burial place of any other governor of the State. 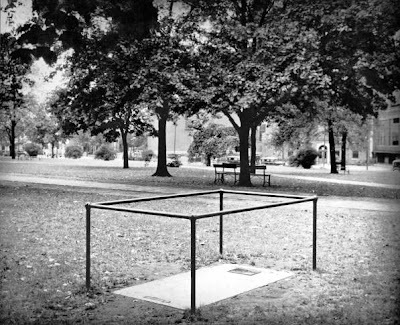 Not much of a "memorial" was erected (as you can see from the black and white), but at least his name was etched on a metal plate on his grave and a iron thingie was put up to keep people from walking on top of it. I'm glad that the GE employees saw fit to build the proper memorial. It's nice and makes the grave not stick out like a sore thumb (like it had in the past). This is an excellent post! I've never been to this park (though I've been by it several times) and I was not aware of its history. Thanks for sharing your recollection and historic information! Query from a Grave Hunter : with several people supposedly NOT moved...in 1908...Law supposedly at the time required a living family member to agree with those 12 businessmen...to move the "graves" and headstones....if our poor Governor's name was no where on this slab...we're there records to determine who was where ? I sure hope there were records to verify....so often with cemeteries that are very old...records have been lost ! I understand just in 2015 .... another person's grave has been found that was not moved... supposedly WM.POLK, son of Rev. Soldier...CAPT. CHARLES POLK of VA. and BARDSTOWN, KY. I HAVE BEEN DOING A LOT RESEARCH ON THE BIGGER FAMILY BECAUSE I AM ONE OF THEM. AND IN MY RESEARCH SAMUEL BIGGER IS A DISTANT RELITIVE. HIS FATHER WAS MY GRANDFATHERS FATHERS, FATHER IF THAT MAKES SINCE. I HAVE BEEN FINDING A LOT OUT ABOUT THIS MAN. IT IS VERY INTERESTING TO ME. Saturday Morning Cartoons - Shazam! "I only see clearly what I remember"
"Yep, This Used To Be The Place..."
"Let's Take A Walk to The Bridge"
To Ride or To Walk? That was the Question.